A twofold thermo-responsive diblock copolymer containing a zwitterionic polysulfobetaine block (P-SPP) and a non-ionic block of poly(N-isopropylacrylamide) (P-NiPAm) was synthesized. While both homopolymers P-SPP and P-NIPAM are thermoresponsive in aqueous solution, exhibiting upper and lower critical solution temperatures (UCST and LCST), respectively, the diblock copolymer undergoes "schizophrenic" temperature-induced aggregation. 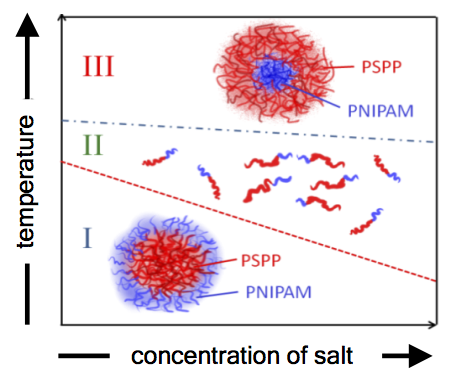 This is investigated in detail by turbidimetry and small-angle neutron scattering (SANS), revealing marked differences of the polymer micelles formed below the UCST-type and above the LCST-type transitions.